Is your drum compatible with Drum Slips? If your drums came from the factory with one of the three emblems above, they ARE NOT compatible with Drum Slips. If your drums came from the factory with one of the above emblems, they ARE compatible with Drum Slips. Championship Maple FFX Snares are available in three sizes: 14x12", 14"x10", and 13"x11". The Championship Maple FFX Series drums have been offered for nearly two decades and have undergone several changes over the years. Championship Maple FFX Snares were equipped with a pewter badge at launch in the 1990's and later changed to a gold badge in the late 2000s. As the badges have no model number information, and the serial number does not reflect the specifics of the equipment, it is important to compare your drum to our reference images to make sure that your drum is compatible. An easy way to check if your snare is compatible is to make sure the badge is pewter or gold. You will also need to make sure that the snare mechanisms are not attached to the shell of the drum. The Drum Slips we offer for Championship Maple FFX Snares are designed for the current variation (late 1990's and up) that have floating snare mechanisms that are attached to the tension posts. Championship Maple Tenors come in several configurations and variations and have undergone several changes over the years. Championship Maple Tenors have the same badge as the Championship Maple FFX Snares. The Championship Maple Tenors were released with a pewter/silver emblem that was later changed to a gold badge in the late 2000's. Like the snares, these badges do not provide any specific information about your equipment. Championship Maple tenors were also released with square lug casings and upgraded to a more sleek rounded lug casing design in the early 2000's. Championship Maple Tenors were originally released with rectangular drum spacers and a flat carrier attachment bar in the 1990's and were later briefly replaced with adjustable spacers and tube style carrier attachment rails in the early/mid 2000's. The adjustable spacers and tube style carrier attachment rails were abandoned in the mid/late 2000's in order to switch back to a new rectangular spacer known as the TS-150 and a new pre-drilled carrier bar that improved on the player's playing position, reduced drum flexing/tilting, and allowed for easier personal customization of spot drum placement. ON2 Percussion Championship Maple Drum Slips have been designed to accommodate all three carrier bars but are only designed for TS-150 spacers and the newer rounded lug casing design. If your drum has older drum spacers, you will be able to manually modify your Drum Slips to make them fit. Drum Slips will not work on drums with square lug casings. Championship Maple Tenors were also offered in Shallow Cut and Articulite versions. Please view our reference images to make sure your equipment is compatible. If your tenor drums came from the factory with one of the above emblems and are one of the configurations listed below, they ARE compatible with Drum Slips. For Special Request Orders please call (601)-656-0222. Championship Maple Bass Drums have received only minor changes over the years. Championship Maple Bass Drums are available in ten different sizes: 14", 16", 18", 20", 22", 24", 26", 28", 30", and 32". The 14"-28" drums are 14" wide while the 30" and 32" drums are 16" wide. 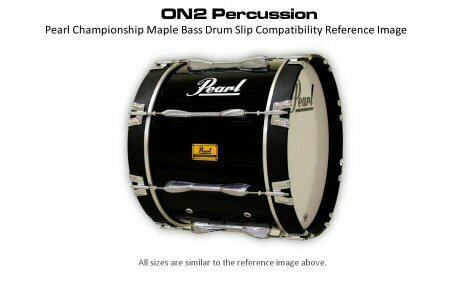 Championship Maple Bass Drums were orginally designed with box style lug casing and later were changed to a rounded lug casing design in the early 2000's. In the mid/late 2000's the 14", 16", and 18" drums had their air holes relocated in order to allow Pearl to place their company logo between the lug casings above the Championship Maple Emblem. Like the Championship Maple Snares and Tenors, the Bass drums also have the pewter or gold badge with no model number information. If your drums have the older air hole locations, our Drum Slips will still fit them, but you will need to manually trim out the two small holes for your older air hole locations. If your Championship Maple Bass Drums have the older box style lug casing, they will not work with our Drum Slips. Please refer to our product images to make sure your drums are compatible. If your bass drums came from the factory with one of the above emblems and are one of the configurations listed below, they ARE compatible with Drum Slips.